Jesus stands at your heart's door and begs to come in. Jesus is the picture of patience, calmness, love, gentleness and long-suffering--the picture of tenderness, gently wooing like a dove. He goes where there are open and receptive hearts that are hungry. He seeks out the low and the humble and the contrite heart, but resisteth the proud. (Lk.1:53; 1Pet.5:5b) He waits lovingly and meekly at your heart's door, not forcing Himself upon you, not pushing the door open, but waiting for you to simply open your heart, and invite Him to come in. Jesus promised, "Behold, I stand at the door and knock. If any man hear My voice and open the door, I WILL come into him." 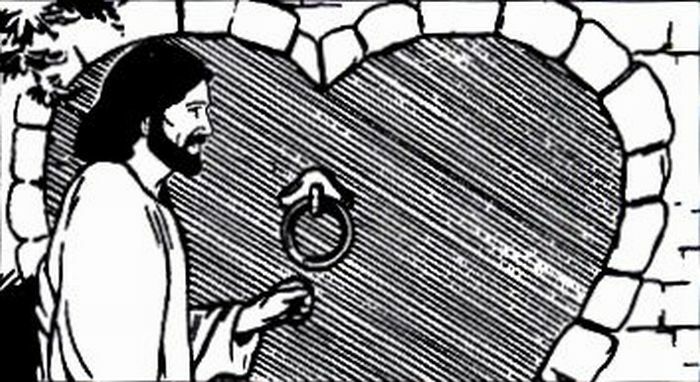 (Rev.3:20) When you open your door to Jesus, He always comes in! He likes to fill every place that's made for Him! If you will just open your heart, His Spirit of Love will flow in! You can have Jesus and all He has to give, which is everything, right this minute if you'll just pray and ask Him to come into your heart with His Love, life, liberty, truth, peace, plenty and happiness here, now and forever! Simply pray: "Jesus, come into my heart! I believe You are the Son of God. Please forgive me for my sins and help me to love You and to love others and to tell them about You, in Jesus' name. Amen."